Dwarf mexican crayfish (Cambarellus patzcuarensis) or Patzcuaro is one of the few crayfish you can keep in a community tank. Why? Because all crayfish are “silent killers”, “cutters” and diggers. They cut tank plants, dig all around the tank bottom and kill fishes. However, Patzcuaro is not like this, but for one simple reason – it is a very small creature. Patzcuaro is from Cambaridae family, Cambarellus species. Dwarf mexican crayfish comes both from Mexico and the USA. Basically it dwells in streams and small rivers, though it can be also encountered in ponds and lakes. It prefers places with slow water flow or standing bodies of water. The crayfish body is covered with strong chitinous carapace of bright orange or even red color, due to which Patzcuaro got its name. The division between large cephalothorax and pleon is very pronounced. This crayfish has 19 pairs of limbs and all of them has their own tasks. It has 5 pairs of ambulatory legs which gave the name to the unit. However, the first pair is quite indirectly connected with walking, since these are chelae which we all know well. They serve as an additional rest for a crayfish, help it to collect food from the bottom, to attack others and to protect itself. It uses antennas and antennules to navigate. It also has 3 pairs of maxilliped limbs to carry the food to its mouth. The chelae can be only technically considered as maxilliped: the crayfish doesn’t use them to walk, but the second pair of its ambulatory legs has small chelae as well. There are 4 pairs of setireme on the crayfish pleon and two pairs of uropods and telson on its tail. Crayfish walk along the bottom by means of its legs, but in case of emergency it abruptly bends it pleon together with telson and moves backwards very fast. We should mention that at that its path of motion is unpredictable, which means that it is not that easy to catch a crayfish in a tank. Despite its large size this is a territory dependent creature. To avoid undesirable rivalry it’s better not to keep more than four Dwarf mexican crayfish species in a tank of 100 liters capacity. The tank bottom can contain any shelters – tank plants, snags, stones and others – the more, the better. The thing is that crayfish need places to hide, which is especially important when crayfish is shedding and becomes totally helpless or for their females when they are carrying eggs. Anything will do as a shelter for a crayfish. It can hide right under a tank plant leave, in a snag crack, under a sprayer or between stones. Water temperature appropriate for this crayfish is 80-83F (25-27С). Tank water рН should be equal to 7 and higher, optimal pH value is 7,5-8. Crayfish sheds its skin from time to time and to grow a new exoskeleton it needs calcium. Correspondingly, carbonate hardness of the tank water (kH) should be equal at least 4. Crayfish can live in soft and acidic water, though not for a long time. If tap water in your area has such parameters and you are going to keep crayfish in a tank, you can settle the matter by putting a piece of limestone or some coral chips on the tank bottom. These creatures are extremely sensitive to ammonia and nitrites, that’s why it’s not a good idea to put them into a brand new filled tank. Another crucial parameter for crayfish is an amount of oxygen in the tank water. From all mentioned above we can conclude that good filtration and aeration are important for crayfish as well as weekly water renew. Firstly, by doing this we decrease nitrates amount in the tank water; secondly, usually crayfish shed their skin and mate when the water is renewed. As a rule, in 2-3 days after tank water renew your crayfish sheds its skin. Also you shouldn’t use any copper containing chemicals – it is very harmful for any crayfish. Can one keep crayfish in a community tank together with other fishes? Yes, you can. But you should bare in mind several peculiarities. The crayfish itself isn’t large. Its chelae are small and it can hardly hurt anyone with them. The scariest thing this crayfish can do, is put up his chelae viciously, but as a rule, it runs away at any sign of danger. 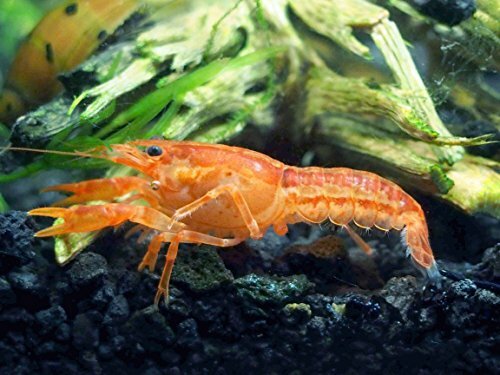 Since crayfish prefer water pH value higher than 7, then platy, molly can be perfect tank mates for Dwarf mexican crayfish as well as other fishes that feel comfortable at рН about 7,5. There shouldn’t be any large and aggressive cichlids in the tank, because they’ll just eat any crayfish in it. Therefore you can see that the range of Dwarf mexican crayfish tank mates is quite wide. We’d also like to mention that it’s very seldom that you see a crayfish walking around the tank bottom. They are good at hiding. Sometimes you may not see them for the whole day and sometimes they all come out in the evening. These do not hide during light hours like most crayfish - they are very active and mobile. This listing is for a B-Grade crayfish, which means that the crayfish will be missing more than one limb. It is quite possible that crayfish are more active in the evening and night hours. So, you shouldn’t bother if you haven’t seen your crayfish for several days, especially if there are a lot of places to hide in your tank. Dwarf mexican crayfish feeds on any organics, for example, tank plant remnants. Things are even easier if you keep crayfish in a community tank. Any fish food will do for them. The main thing is that this food gets to the tank bottom. Tablets and pellets for catfish are the best in this case. Bloodworm and brine shrimp will also do. If you want, you can feed your crayfish with some delicacy, such as a piece of cucumber, squash, carrot. Don’t forget that crayfish is a scavenger. So, what if some fish dies while you are away? Here comes a crayfish! They will eat its body in a very short time and won’t let is rot and spoil the tank water. All crustaceans shed their skin from time to time and Dwarf mexican crayfish isn’t an exception in this respect. Replacing its old exoskeleton with a new one is the only way for a crayfish to grow. Dwarf mexican crayfish juveniles shed their skin rather often – once in 7-10 days. Adult dwarf mexican crayfish species shed more seldom. It is crucial for a crayfish to have a place to hide while shedding. The crayfish stays in its shelter till its new chitinous carapace hardens. A crayfish without its carapace is completely helpless. Besides, shedding is the only way for it to grow its lost limbs. Crayfish loose their legs under various circumstances. Very often their chelae suffer the most, since they are its largest limbs. It can get stuck somewhere, considering where crayfish like hiding. Also they may loose their limbs just when shedding – if the crayfish can’t take it out from its old carapace, it just cuts or bites it off. In both cases this is called autotomy. However, it is a very rare thing when crayfish harms one of its kind, not to mention killing one while fighting (since fights happen sometimes). So, if you have seen a crayfish with one chela – don’t worry, a new one will grow soon, during the next shedding period. As well as living with one chela will not affect its quality of life in any way. Crayfish are diclinous species. Dwarf mexican crayfish male are smaller than female. They have strong chelae and a copulatory organ (a modified pair of limbs) on their abdomen. Dwarf mexican crayfish lifespan isn’t long, it equals about 1.5-2 years. However, there is some information that these species can live longer. Therefore if you like crayfish, you’ll have to become aware of their breeding process. 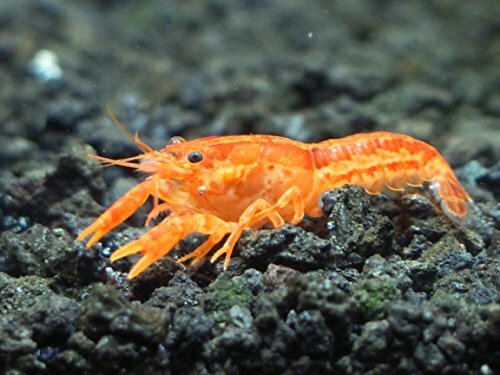 Dwarf mexican crayfish breeding as a rule occurs without any participation of the aquarist except the cases when crayfish are kept in a community tank. Dwarf mexican crayfish juveniles are small and they shed their skin very often. So, even if their tank mates are the most peaceful fish you can find, they still have no chances to survive. Easy to care for - the CPO crayfish feed on leftover food or almost any kind of fish food. Dwarf mexican crayfish mating occurs right after the shedding process. After this you will see eggs on the abdomen of Dwarf mexican crayfish female. The eggs are quite large, not transparent and they are easily seen. But the problem here is that the female crayfish tries not to leave her shelter without any necessity. That’s why if it’s not a crayfish species tank you have, it’s better to prepare a separate tank for Dwarf mexican crayfish juveniles. You should keep in mind, that adult crayfish is indifferent both to its or anyone else’s offspring and at that they don’t take care about their juveniles either.